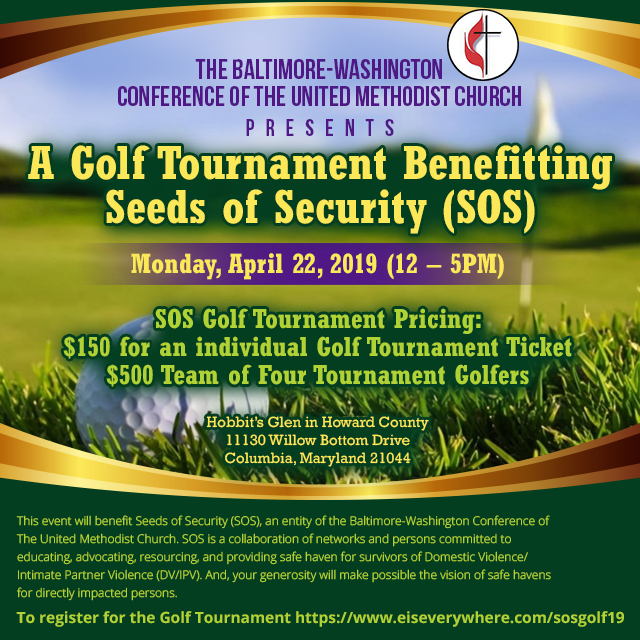 The Seeds of Security Golf Tournament will be held at Hobbits Glen Golf Course, 11130 Willow Bottom Drive, Columbia, MD 21044, on April 22, 2019, from noon to 5 p.m.
You can choose to register one player or a team of four. Please remember to add your name and shirt size to the registration page before completing your purchase. Seeds of Security, an entity of The Baltimore-Washington Conference of The United Methodist Church, is a collaboration of networks and persons committed to educating, advocating, resourcing, and providing a safe haven for survivors of Domestic Violence/Intimate Partner Violence (DV/IPV). By attending the Seeds of Security Golf Tournament, you will help us be a source of healing for persons experiencing the practical, relational, and spiritual impact of intimate partner violence.